Did She Stump the Minister? 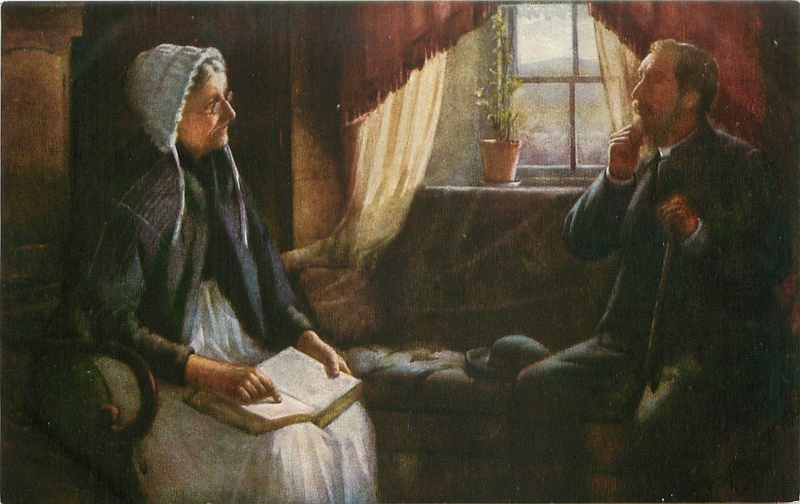 “A Difficult Text” is the title of this 1907 painting by John Henry Dobson. All the little details help tell the story of a minister’s visit to a member of his congregation. Do you think the minister looks a trifle perplexed? If only we knew which Bible verse she’s pointing to! p.s. You can click on the image to see a larger version. Looks like it’s in the New Testament! My guess it’s in Romans–plenty of stumpers in there! I think its New Testament, too, Karen. And there are definitely some head-scratchers in Romans!